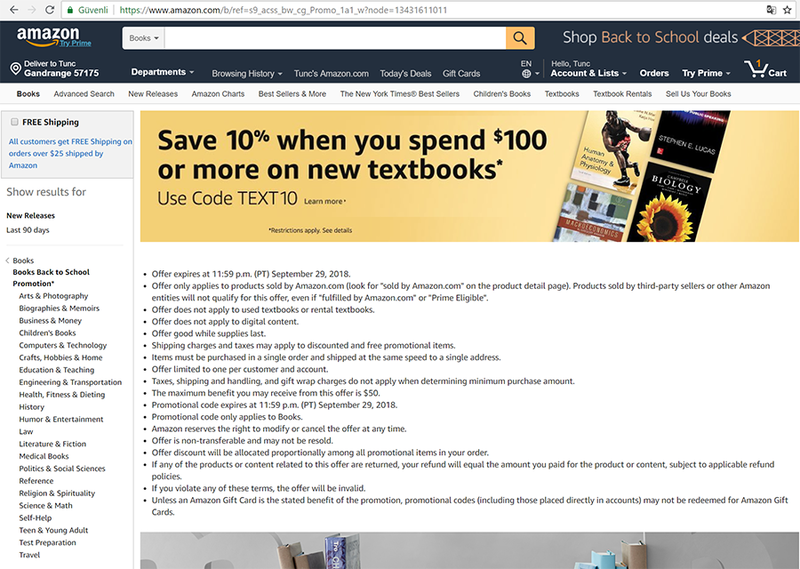 Bu indirim kodu ile Amazon.com sitesindeki textbooks kategorisinden 100$ ve üzeri alışverişte %10 indirim alacaksınız. Offer only applies to products sold by Amazon.com (look for “sold by Amazon.com” on the product detail page). Products sold by third-party sellers or other Amazon entities will not qualify for this offer, even if “fulfilled by Amazon.com” or “Prime Eligible”. Offer does not apply to used textbooks or rental textbooks. Offer does not apply to digital content. Offer good while supplies last. Shipping charges and taxes may apply to discounted and free promotional items. Items must be purchased in a single order and shipped at the same speed to a single address. Offer limited to one per customer and account. Taxes, shipping and handling, and gift wrap charges do not apply when determining minimum purchase amount. The maximum benefit you may receive from this offer is $50. Promotional code expires at 11:59 p.m. (PT) September 29, 2018. Promotional code only applies to Books. Amazon reserves the right to modify or cancel the offer at any time. Offer is non-transferable and may not be resold. Offer discount will be allocated proportionally among all promotional items in your order. If any of the products or content related to this offer are returned, your refund will equal the amount you paid for the product or content, subject to applicable refund policies. If you violate any of these terms, the offer will be invalid. Unless an Amazon Gift Card is the stated benefit of the promotion, promotional codes (including those placed directly in accounts) may not be redeemed for Amazon Gift Cards.